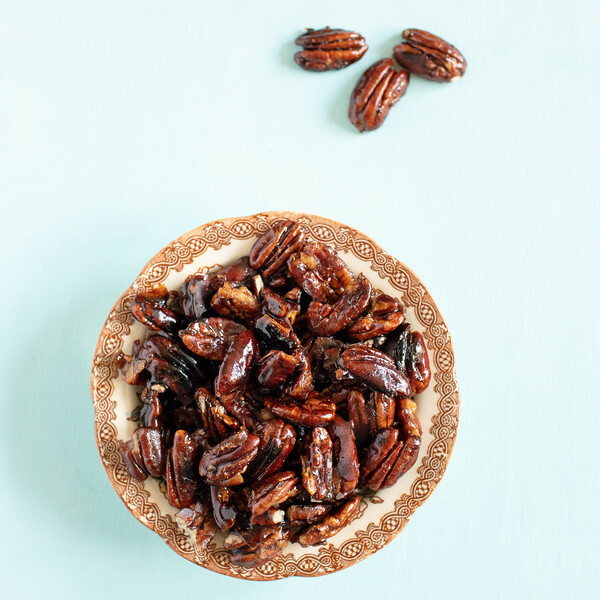 These Bourbon Candied Pecans take pecans to a whole new level! So easy to make and incredibly delicious! Perfect to snack on use them to top salads! Last week, I remade an old recipe post, Chicken Cutlets with Strawberry Avocado Salsa (new photos coming soon!) The next day, I decided I wanted to turn the rest of the chicken and the salsa into a salad. I had some blueberries in the fridge that would be perfect. All I needed was a yummy salad topping. Looking around, I spotted a bag of pecans. Candied nuts are one of my favorite salad toppings and they would be so good on this fruit and chicken salad. Making candied pecans is so easy, but I wondered if there was a way to kick it up a notch. Turns out there is! I paged through several cookbooks and magazines for ideas and found in an old 2014 Donna Hay magazine a recipe for Pavlova topped with whiskey pecans! The pecans sounded like they would be amazing on my salad! Toasted Pecans – since you are cooking these on the stove and not in the oven, you want to give them a quick toast first. You can do it right in the pan that you are going to cook them in. Just turn the heat to medium high and add the pecans. Stirring them, keep an eye on them, they can from toasted to dark quickly. Sugar – white, superfine if you can find it. Vanilla Extract – I used my Homemade Vanilla Extract. 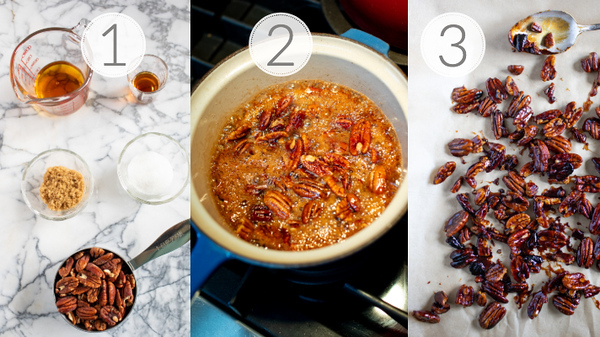 Step 1 – Gather Your Ingredients – pecans, brown sugar, white sugar, whiskey, and vanilla extract. Step 2 – Line a baking sheet with parchment paper. Add all the ingredients into a small saucepan over medium heat. Cook for about 6-7 minutes or until golden and syrupy. Stir during the last minute. Step 3 – Quickly spoon out the pecans onto the parchment lined baking sheet and spread them out as best you can. Let cool and then break apart. That’s it, that’s all there is to making these amazingly delicious candied pecans. We used them on that salad and then I put the rest in a container sitting on the counter. They make a great snack and would be perfect on an appetizer tray. These are the best candied pecans and would also make great gifts! I’ll have to remember to share these around Christmas time – because a jar of these and a bottle of bourbon would make some of my friends and family very happy! The very best candied pecans! A touch of bourbon takes them over the top, but they are still crazy easy! Put a small saucepan over medium heat. Add pecans, both sugars, vanilla extract and bourbon in the pan. Stir to combine. Let cook for about 6-7 minutes. It will begin to boil and turn a dark amber color. Stir at the very end. Quickly pour out the pecans onto the baking sheet and spread them as best you can. Let them cool and then break apart. If your pecans aren't toasted, you can toast them right in the pot. Add them to the pot first and over medium heat stir them until they are fragrant and beginning to turn brown. These will keep in an airtight jar for two to three weeks. I love candied pecans in salad. These look delicious. Wonderful recipe! Adding some nice, sweet crunch to a summer salad sounds like a delicious idea! Beautiful photos too. Thank you! 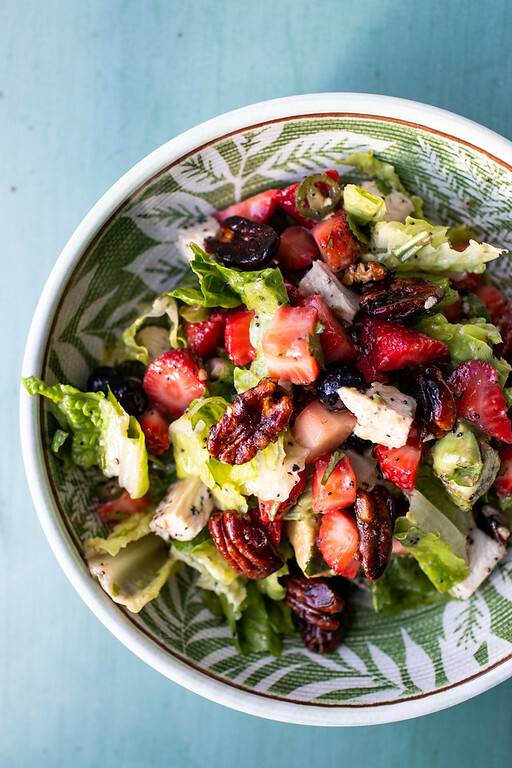 It definitely adds a sweet crunch to a summer salad! This sounds great! Every time I’ve attempted to candy nuts something goes wacky on me. I’ll be givinf your recipe a try! Yes, it is surprisingly easy! Ooh! 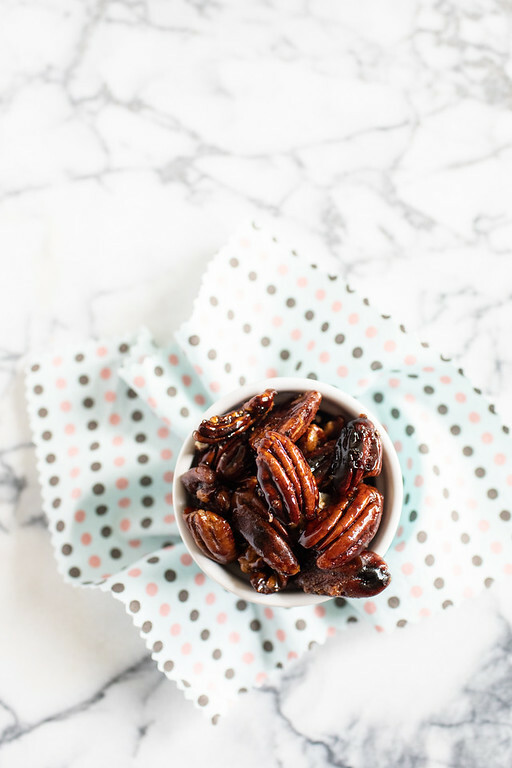 I just love candied pecans (and bourbon when I’m not pregnant)! These look so easy. I might put them on ice cream all summer!! What a delicious recipe, Pam! I can only imagine how many uses you can get from these delicious pecans. In a salad would be superb. They are my new favorite salad topping! Oh my goodness. I am drooling over these pictures. I love pecans for a snack! I am a big fan of both crunchy salad toppings and bourbon – these sound right up my alley!